I can’t believe BlogHer Food is in just a few days – I’m so excited to go and I hope to see many of you there! Please let me know if you’re showing up, or just come up and say “hi!” if you see me there! I look forward to meeting you all! In other news, an explanation for my absence: I am working on a little project that is extremely exciting to me and I hope will be for you as well. 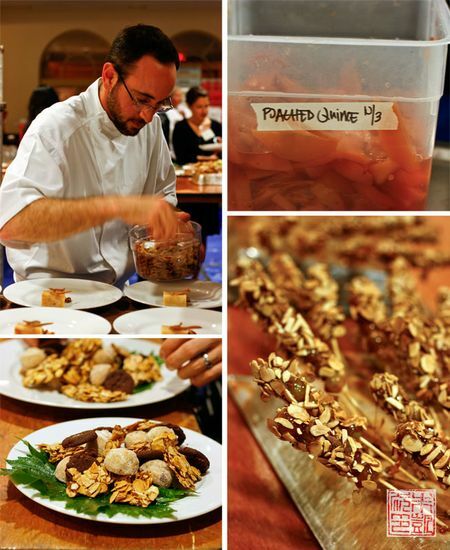 At Michael Recchiuti’s lovely chocolate and soy tasting several weeks ago, I was introduced to pastry chef William Werner (apparently this tasting turned out to be a serendipitous networking event, with numerous friends-and-colleagues of Michael in attendance). The former pastry chef of Quince and the Ritz-Carlton at Half Moon Bay, William is about to open his very own venture in San Francisco, the distinctively monikered Tell Tale Preserve Company (Yes, he is a fan of Edgar Allen Poe). 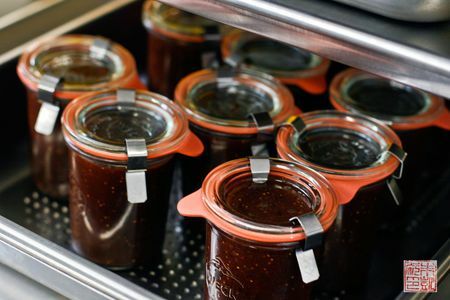 Tell Tale will be a pâtisserie and delicatessen, serving everything from morning pastries to sandwiches, cakes to confections, and jams (I discovered the art of preserving is sort of a pet passion of William’s). The shop is slated to open mid-November, although the pastry kitchen is already up and running and providing previews of the sweetness to come in two forms: small batch deliveries to local coffee shops Coffee Bar and Sightglass Coffee, and Tell Tale Society, a monthly bag of unique treats sent out to subscribers. Visit the company site for a sampling of what’s coming out of the kitchen. 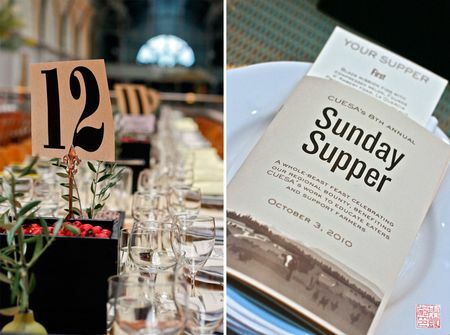 To give you another taste of Tell Tale, I got a chance to help out last weekend at CUESA’s Sunday Supper, an annual fundraising event held at the Ferry Building that brings together local chefs, farmers, and artisans for a family-style feast. 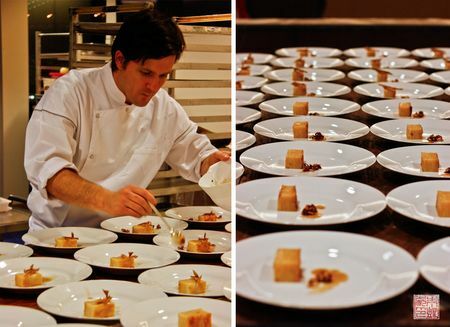 The theme this year was “The Whole Beast”, and featured main courses of a whole beast carved tableside. As one of the dessert courses, our group plated last in the evening, leaving us plenty of time to mingle and observe the festivities. 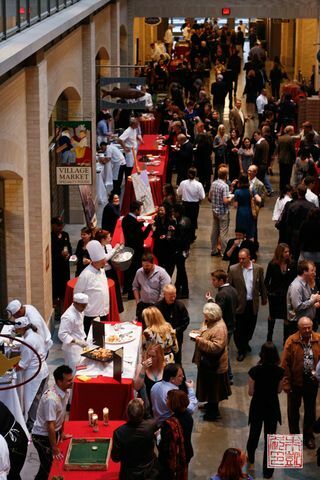 Above, dinner guests mingling in the main concourse of the Ferry Building during reception hour. Ok, the lighting is terrible in this shot, but it's not often you get to work in a prep room with a view of the San Francisco bay. The night ephemeral. 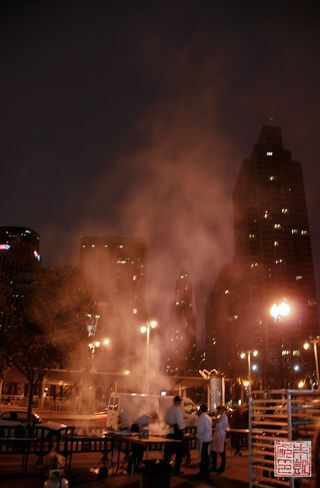 Smoke rising from the outdoor grills where the whole beasts were being cooked. 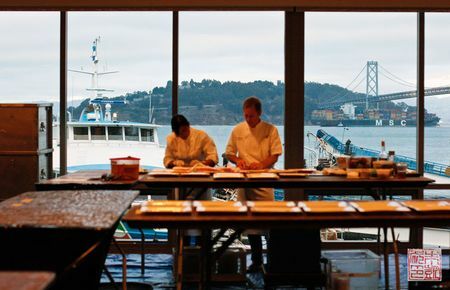 Scenes from the kitchen inside: in the upper left corner is Greg Mindel, also of Tell Tale. I already know Greg from before: he taught the professional pastry program at Tante Marie’s after my instructor Rachel left, and then he went to SFBI to head up their professional pastry program. Both programs are ones I highly recommend, so for all of you who have questions about them that I haven’t answered, well, now is a really good time to e-mail me and I’ll pass them on to him! 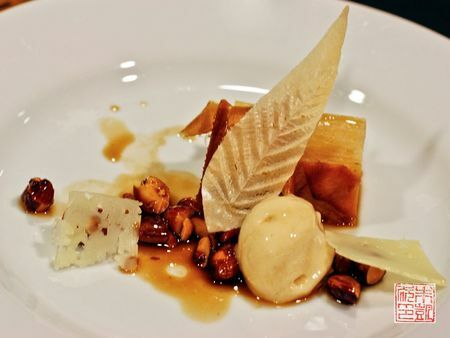 William’s course was entitled Toute la Pomme, or The Whole Apple: apple terrine made from apple slices; apple cracklings made from the apple skin, dragee almonds in a gastrique of vanilla oil, maple vinegar, and muscavado; and slices of sheep’s milk cheese. 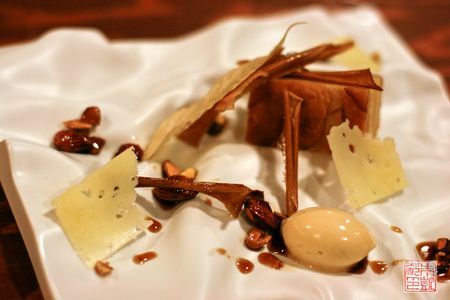 The little leaf decoration is made from apple puree. P.S. That's William on the left. After learning about Tell Tale and seeing the amazingness of the kitchen (believe me when I say it’s a really nice space), I decided this would be the perfect opportunity to do a piece on what goes into the opening of a bakery. It’s been a couple years since I’ve written “Want to Go to Pastry School?”, but I still receive comments on it, and I still get e-mails from baking enthusiasts asking me for advice on pursuing their pastry dreams. I’m touched that all of you are sharing your passions with me, and I hope my experiences can help you get started on your own journey. Many of the e-mails I get revolve around how to intern(stage) in a bakery or how to start one’s own bakery. To answer the first question: just ask! That’s what I did. Sometimes you’ll get turned down, but sometimes you’ll find someone like William who says yes and is also cool to work for. As for the second question, that’s pretty difficult for me to answer since I haven’t opened my own place, but I figured the next best thing is to give you a behind-the-scenes glimpse at the making of one: the planning, the testing, the organizing, the decision-making, all leading up to the denouement. It’s going to be a fun ride. So, over the next month I’ll be posting a se ries of pieces on Tell Tale Preserve Company and give you an idea of what goes into opening a bakery. I’d like to invite you to submit any questions you might have or what you’d like to see and I’ll do my best to incorporate them, as long as Tell Tale indulges me. Please stay tuned! And I hope to see you at BlogHer Food! Hope to see you at BlogHer Food! I can’t wait to see you at Blogher Food. I look forward to your posts! How fun! Awesome idea Anita! Your “Want to go to pastry school?” summary helped me immensely in my decision to apply to Tante Marie, so I can only imagine that your documentation of the opening of Tell Tale will be immensely beneficial for the baking community. I’ve tried doing some online research of what it takes to open you own shop, and sadly there isn’t much out there, at least that I was able to find. I’m looking forward to the series and will let you know if I think of anything in particular that I’d be interested in learning about. im very excited to see your thoughts on starting a bakery! it is a dream of mine, albeit a distant one. thanks for sharing your knowledge and lovely photos!